Polypseudorotaxane, characterized by the mechanical linkage of its components, exhibits unique chemical, physical, rheological, and mechanical properties and has attracted much attention of scientists due to its wide applications in various fields including drug delivery carriers, stimuli-responsive materials, and healable materials. Polypseudorotaxanes can be mainly divided into three classes: side-chain polypseudorotaxanes, main-chain polypseudorotaxanes, and others (such as cross-linked and branched polypseudorotaxanes). In this chapter, the recent advances of these three classes of polypseudorotaxanes constructed by crown ethers are reviewed. Moreover, their future developments are also prospected. In 1967 Pederson reported dibenzo-18-crown-6 as a molecular host for cationic guests, which opened the gate of supramolecular chemistry . Crown ether, a traditional macrocyclic host, is composed of oxygen atoms linked by alkyl chains and plays a vital role in supramolecular chemistry. A unique structure makes them have a strong binding with secondary ammonium and leads them to be appealing building blocks in fabricating intriguing assemblies. Supramolecular devices including pseudorotaxane constructed by crown ether were very fascinated as it embedded multistimuli-responsive features (thermo-, pH-, and chemo-) . Much attention has been given to the design and synthesis of macrocyclic molecules in science. These molecules could form mechanically interlocked molecules (MIMs) such as pseudorotaxanes , rotaxanes , catenanes , and cryptands  with appropriate guest, which acts as a potential candidate for molecular devices, molecular switches, and machines. In the past decades, various template strategies have been developed to construct topologically intriguing supermolecules. The topology or shape of a polymer is one of the most essential factors on determining its property. 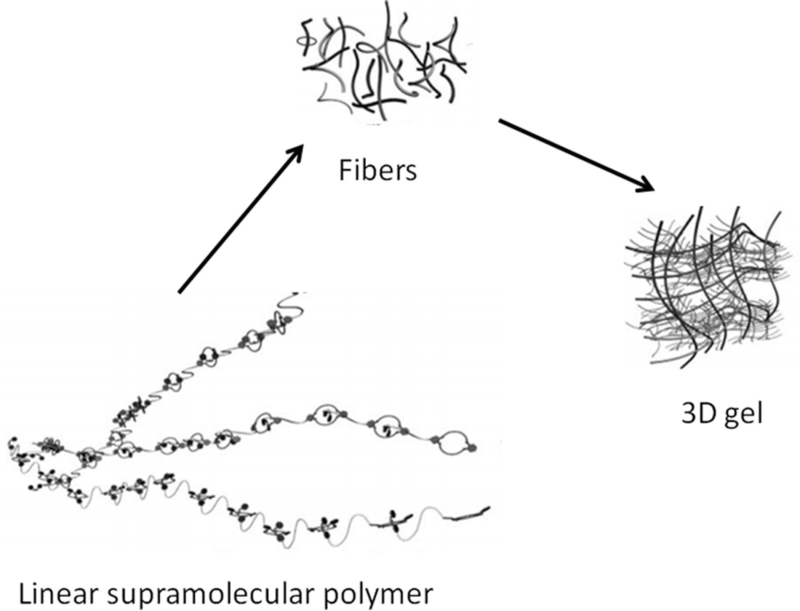 A variety of polymer structures, such as cyclic, linear, grafted, and branched polymers, have been reported so far. Compared with traditional polymers, supramolecular polymers show some advantages in the fabrication of responsive or reversible materials. The development of supramolecular polymers also offers a platform to construct complex and sophisticated materials via a bottom-up approach. Supramolecular polymers can be prepared in solution, in gel, and in the solid state. A dynamic polymer system without cleavage of the covalent bond that undergoes a topological change is required to transform the polymer topology with sufficient structural stability similar to that of a covalent compound. Bu and coworkers  synthesized a crown ether-functionalized poly(tetraphenylethene) (AP-TPE) and successfully restricted the rotation of the tetraphenylethene (TPE) group via the complexation of organic ammonium salt and crown ether, leading to a stepwise enhanced fluorescence emission accompanied by a morphological transition from micelle to vesicle (Fig. 1). In comparison with 1,2-bis(4-ethynylphenyl)-1,2-diphenylethene, the absorption of AP-TPE showed a big red shift from 329 nm to 378 nm, showing no difference with the high conjugation of AP-TPE [8, 9]. 1H NMR spectroscopy was used to investigate the complexation between guest groups and AP-TPE. The size of the polymer was much smaller than the length of AP-TPE, which may be caused by the aggregation of AP-TPE under the present solvent condition. After the binding with C12-2H_PF6, the Dh band of supramolecular complexes increased to 294 nm with a much broader signal. Upon addition of the guest, the fluorescence emission band of AP-TPE at 525 nm showed a clear increase. The host–guest recognition restricts the intramolecular rotation of AIEgens, and thus non-radiative pathway is blocked, which further causes a visible fluorescence enhancement [10, 11]. In this case, after the first acidification, dibenzylammonium salts (DBAs) bound with dibenzo-24-crown-8(DB24C8) to form polar groups. 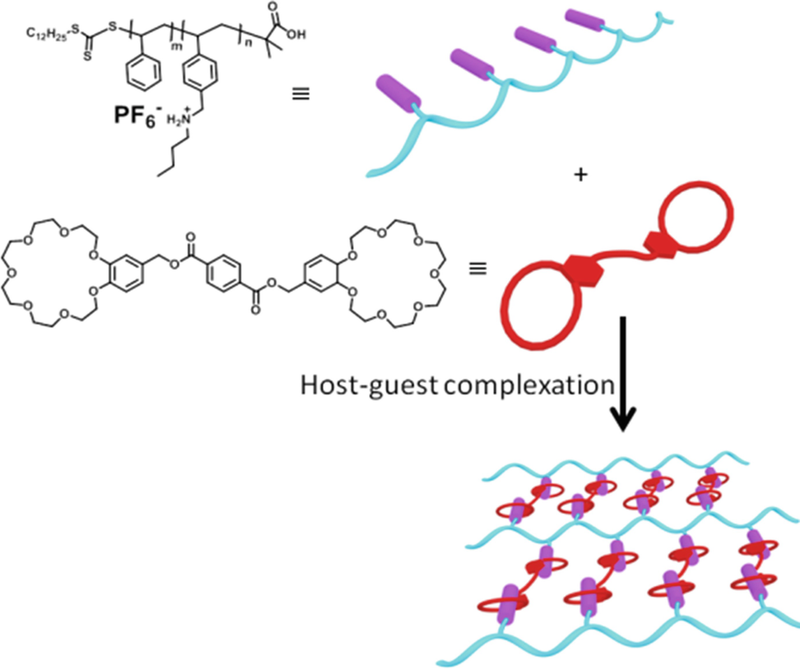 Benefiting from the solvophobic effect, the host–guest complex formed a micelle with the polar groups located on the inner side. The subsequent reaction product further promoted the aggregation named salting-out effect. Recent studies showed that ammonium and its derivatives have been utilized as proton conductors in ionic liquids  and metal–organic frameworks , respectively. Bu et al. 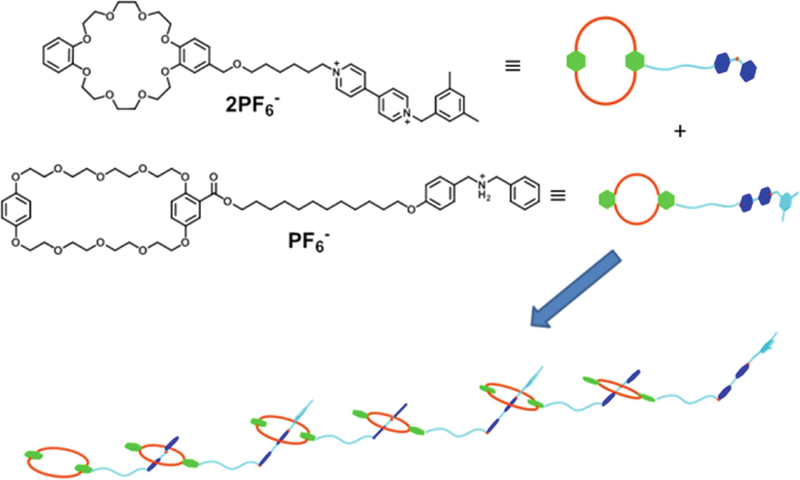 reported some supramolecular connection mode forms with two-dimensional ionic channels that show controllable and appreciable proton-conducting behaviors. The starlike polymer of poly(ɛ-caprolactone dibenzylammonium salt (PCL-DBA) contained four DBA-terminated poly(ɛ-caprolactone (PCL) arms. The supramolecular network (Mo132-PCL and W12-PCL) was also obtained using PCL-DBA and DB24C8, where their molar ratio was controlled as 1:1. Considering that the present proton conductivity is originated from the NH2+ group, the increases in the proton conductivities of both W12-PCL and Mo132-PCL should arise from the aforementioned formation of pseudorotaxanes between DBA ion and DB24C8 group, leading to the formation of supramolecular networks. Conductive AFM images showed that the patterns were electrically pronounced in a pA range. This is the first report that secondary dialkylammonium salt/crown ether pseudorotaxanes were utilized as proton conductors (Fig. 2) . Yan et al. reported a bis(p-phenylene)-34-crown-10 (BPP34C10) derivative bearing two pyridyl groups and studied its binding to paraquat and 2,7-diazapyrenium derivative (DAP) (Fig. 3) . Upon the addition of di-Pt(II) acceptor, polypseudorotaxanes were formed. The themes of coordination-driven self-assembly, host–guest interactions, and supramolecular polymerization are unified in an orthogonal manner. It was found that the binding ability of DAP to the crown ether is stronger than that of paraquat. Interestingly, after DAP was added into polypseudorotaxane, the more stable polypseudorotaxane was formed. The dynamical and reversible supramolecular polymer backbone with reversibility and adaptability makes it potentially useful in areas such as stimuli-responsive materials. During the past two decades, the Gibson team has been working on polypseudorotaxanes based on crown ethers. In 1998, they reported a polypseudorotaxane by threading linear paraquat through the cavities of cyclic repeated units of polymacrocycle. The change of color and proton NMR spectroscopy could validate the formation of polypseudorotaxane. With increasing amounts of paraquat, m/n value of polypseudorotaxane increased, as well as with decreasing temperature. The values of ΔS, K, and ΔH provided the foundation for predicting the m/n values for the preparation of analogous systems . To further expand the research, they built the first supramolecular comblike graft copolymer based on pseudorotaxane constructed from two polymeric building blocks: a paraquat-terminated polystyrene and a main-chain crown ether polyester (Fig. 4) . Introduction of appropriate blocking groups onto the paraquat units of this system after complexation will produce a mechanically interlocked comblike graft copolymeric rotaxane. A dramatic viscosity increase in solutions of two components, NMR chemical shift changes in solution, the lack of phase separation by both optical microscopy and small-angle laser light scattering (SALLS), and the observation of a single Tg by DSC jointly proved the formation of graft copolymer. Huang et al. endeavor to utilize a multicomponent self-assembly strategy to achieve hierarchical and more complicated supramolecular polymers. Therefore, by integration of the “self-sorting” concept, they prepared alternating supramolecular copolymers. Early studies demonstrated that secondary dialkylammonium salts bound DB24C8 strongly and resided within the macrocyclic cavity . Luckily, they found that DBA/DB24C8 complex and paraquat/BPP34C10 complex are a pair of building blocks with “self-sorting” recognition behavior in solution [19, 20, 21]. 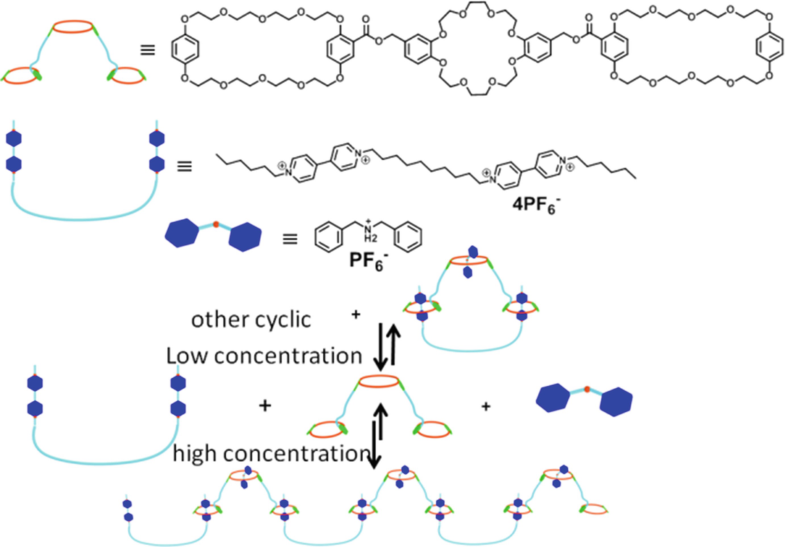 Based on this self-sorting organization, they constructed an alternating supramolecular copolymer (Fig. 5) . They demonstrated that self-sorting organization of two AB-type heteroditopic monomers could result in the formation of supramolecular alternating copolymers in solution which was confirmed by DLS, CV, 1H NMR, SEM, and viscosity measurements. The degree of polymerization was dependent on the initial concentrations of two monomers. Morphology control of suprapolymers is essential for their future applications. Supramolecular polymers using dynamic assembled chains with low molar mass monomers by reversible highly directional noncovalent interactions have shown traditional polymeric properties in solution and in the bulk. Further, they used the self-sorting organization principle to prepare a supramolecular pseudopolyrotaxane with monomer and two BPP34C10 macrocycles and a DB24C8 ring linked by covalent bonds. 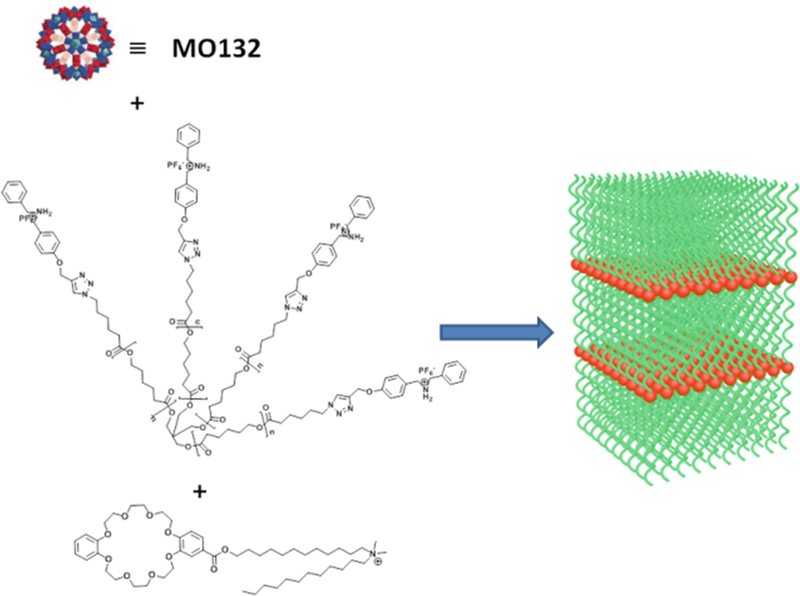 By exclusively forming pseudorotaxanes between BPP34C10 host moieties and paraquat guest units, the supramolecular polymer backbone would be afforded (Fig. 6) . The DB24C8 units were left free until the addition of dibenzylammonium salt. After the cavities of DB24C8 units were filled by dibenzylammonium salt, the DB24C8 units became more rigid, and the properties of resulting polymer were obviously different from the unfilled ones, such as specific viscosity, rheological properties, and critical polymerization concentration (CPC) values. 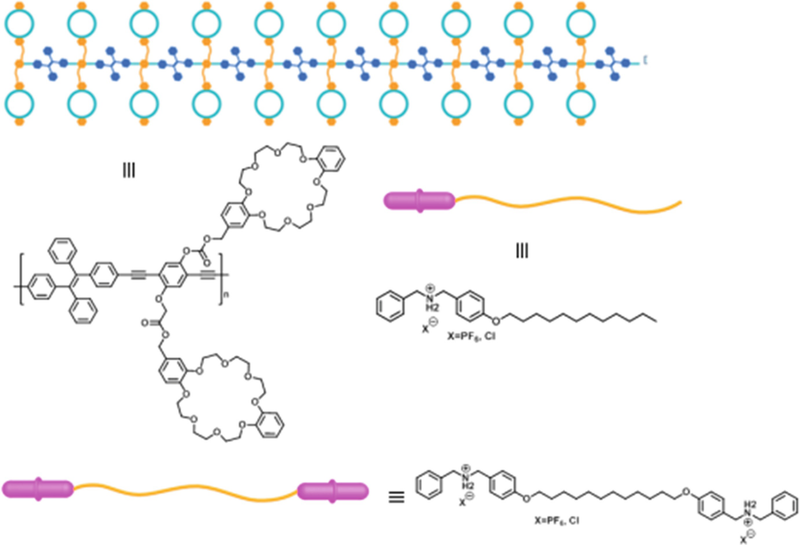 Although supramolecular alternating copolymers prepared from self-sorting organization of two heteroditopic monomers were reported, supramolecular polymer gels formed from small molecules by crown ether-based molecular recognition have been few reported. Shinkai and coworkers have developed gelators comprised of crown ethers [24, 25, 26], where the driving forces for the gelation were largely attributed to the appended groups. It is still a big challenge to design and synthesize novel stimuli-responsive gels completely based on the host–guest interactions between crown ethers and its complementary guest moieties. In 2011, benefiting from crown ether-based molecular recognition, a dual-responsive supramolecular polymer gel was built (Fig. 7) . The system has thermo- and pH- responsive abilities. 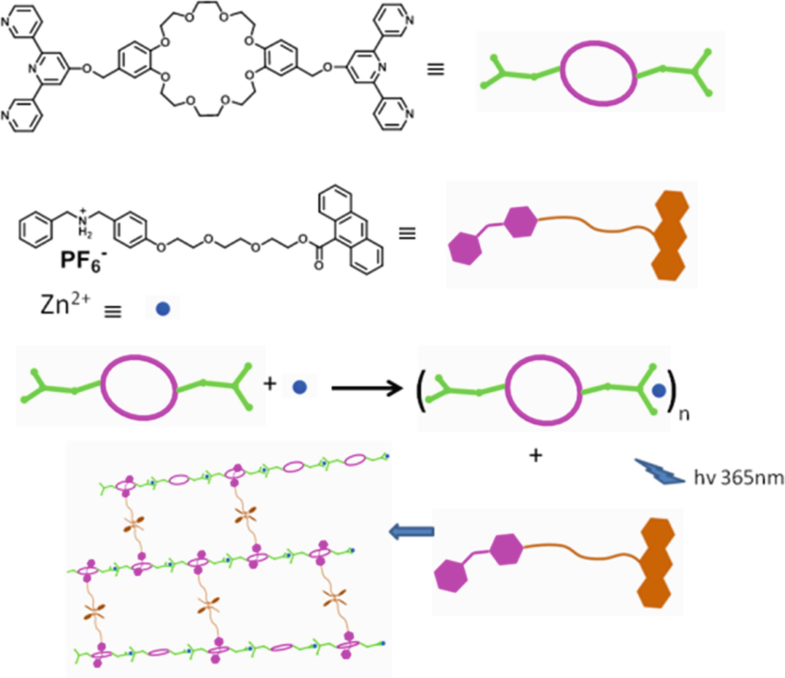 Long flexible alkyl chains play an important role as physical junctions in supramolecular gels which were found to contribute to the formation of linear supramolecular polymers. 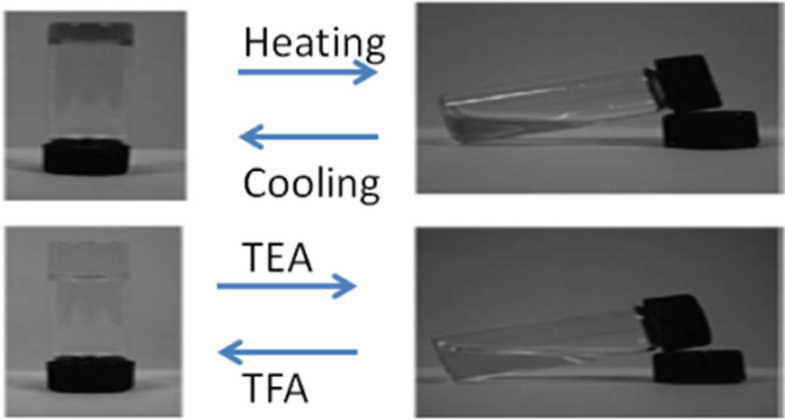 The supramolecular polymer gel showed excellent reversible phase transitions by cooling and heating or by adding acid and base. Benefiting from the relatively low activation energy required for breaking weak bonds, supramolecular gels can respond to external stimuli (pH, temperature, electric/magnetic fields, and solvent composition), and thus they can serve as functional membranes, smart devices, and drug delivery carriers [28, 29, 30, 31]. 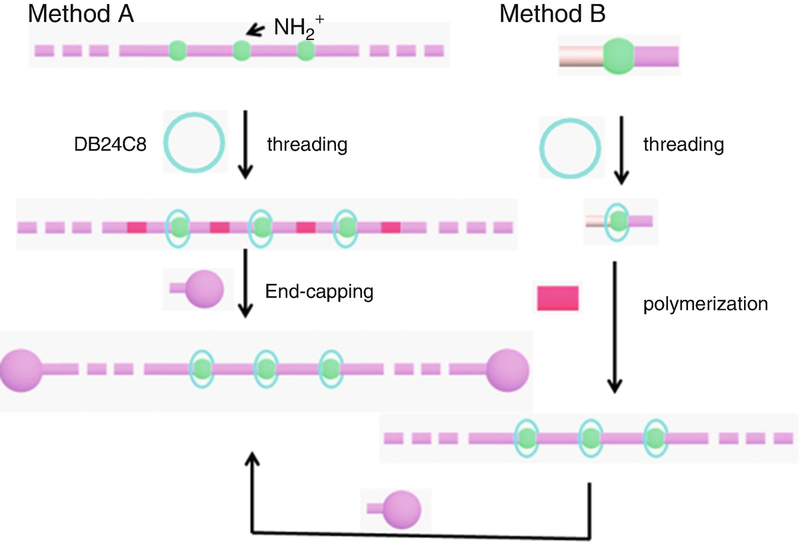 Owing to the difficulties encountered in synthesizing well defined polymer precursors embedding multiple crown ether hosts at predetermined positions. 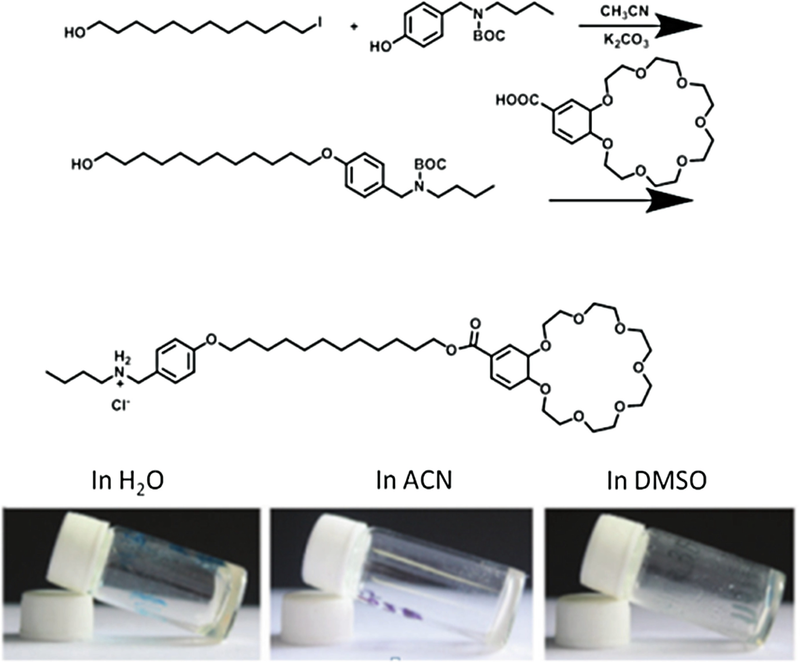 Liu and Huang co-built supramolecular gels on the basis of reversible molecular recognition between dibenzylammonium salt (DBAS) moieties and DB24C8, with biodegradable poly(e-caprolactone) (PCL) scaffold (Fig. 8) . Two-arm PCL–DBAS and four-arm star PCL–DB24C8 incorporate complementary molecular recognition moieties. Pseudorotaxane formation between dibenzylammonium moieties and crown ether will form supramolecular networks and an increase of size of polymer chains. The growth of supramolecular networks with increasing polymer could be confirmed by the dramatic increase of reduced viscosity. At even higher polymer concentrations, the formation of supramolecular gels and reversible pH- and thermo-induced gel–sol transitions can be visualized macroscopically. The DSC thermogram of the mixture revealed a broad endothermic peak in the temperature range 55–80 °C compared with those of the two separate components, which can be attributed to disruption of the interactions between DBAS and DB24C8 moieties. This result kept consistent with that obtained by 1H NMR spectroscopic studies. Although much progress has been made in the preparation of cross-linked supramolecular gels based on host–guest interactions , the study of their properties was mainly focused on their self-healing, and stimuli-responsive supramolecular gels have been rarely reported . Huang et al. prepared two noncovalently cross-linked polymer gels by mixing pendent dibenzocrown-8 (DB24C8) with a poly(methyl methacrylate) (PMMA) polymer groups and two bisammonium cross-linkers with different end-group sizes under different conditions (Fig. 9) . Because of the larger size of the cyclohexyl unit, it took longer time to achieve equilibrium. 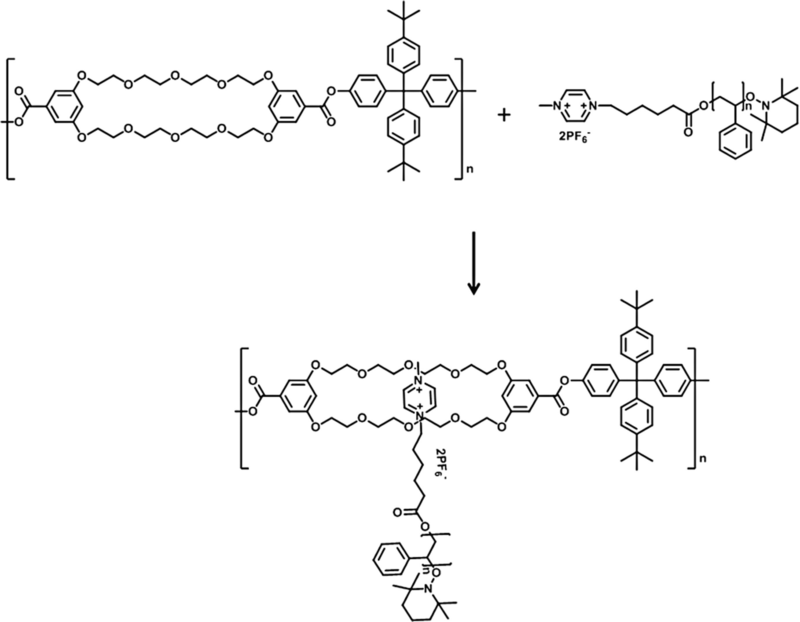 Viscometry gave direct evidence of the existence of polymer networks in these two gels. Both the specific viscosities and reduced viscosities of the two gels are larger than those of polymer. To further investigate the formation of supramolecular gels and supramolecular networks, we considered the extent of cross-linking and calculated that the mean numbers of elastically active cross-linkers per chain (f*) of gels were 3.49 and 1.01, respectively. From these data, it is inferred that 48.5% and 14.0% of DB24C8 units are complexed to form elastically active cross-linkers in gels, respectively. Moreover, the gels exhibit excellent self-healing properties, which not only can be seen visually and directly, but also were fully studied using rheological measurements, showing 100% recovery even under 10,000% strain in less than 10 s over several cycles. 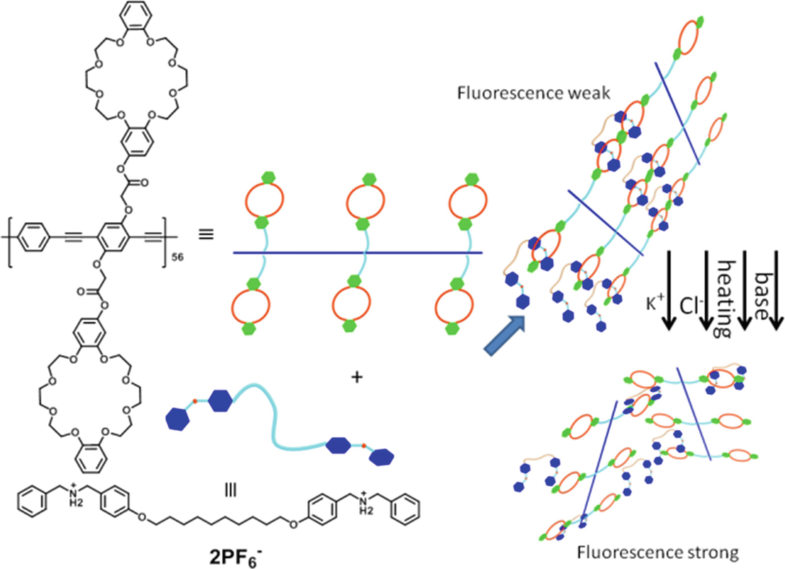 Nowadays, on account of their high selectivity and sensitivity, much attention has been given to supramolecular cross-linked network-based fluorescent sensors, especially those whose polymeric backbones are fluorescent conjugated polymers [36, 37, 38]. Thus, the disassembly of the conjugated polymer network could be triggered by multiple stimuli. Huang et al. 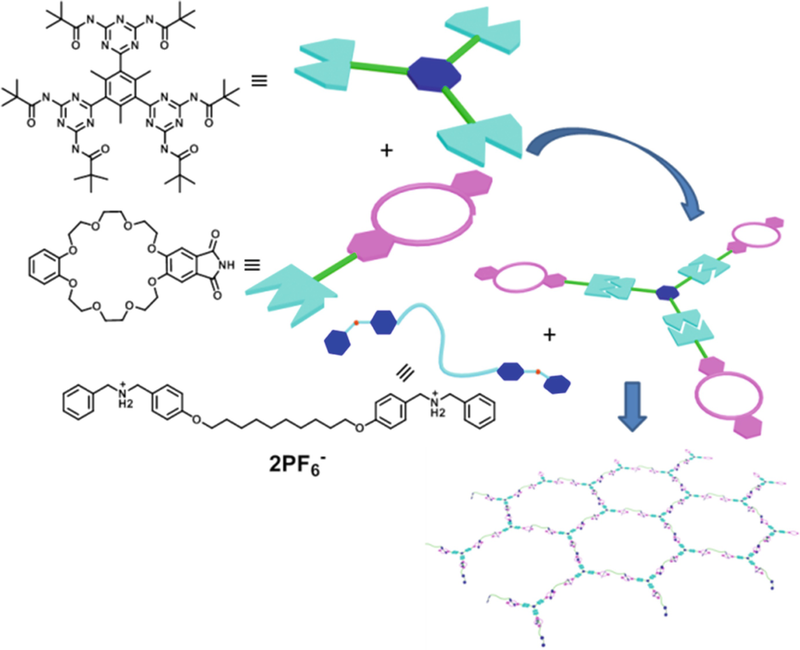 prepared a cross-linked polymer supramolecular network simply by mixing a bisammonium salt cross-linker and a poly(phenylene ethynylene) (PPE) polymer decorating pendent DB24C8 groups (Fig. 10) . When the secondary ammonium salt moieties interact with DB24C8 units, the network will form, causing the aggregation of polymer main chains and leading to a sharp decrease of fluorescence emission intensity compared to that of the PPE polymer. After treatment with Cl− or K+, collapse will happen to the network, and the recovery of the fluorescence intensity will occur. Moreover, the supramolecular network is also responsive to temperature and pH changes. Therefore, this system could be used as types of sensors: an anion sensor, a cation sensor, a temperature sensor, and a pH sensor. The system can be used in thin film and solution. Exposure of a film made from this network to ammonia leads to an increase of fluorescence intensity from the film, which makes it a good candidate for gas sensing. Triptycenes are a class of compounds with a unique paddle wheel structure and have wide applications in material science, supramolecular chemistry, and other research fields . A variety of triptycene-crown ether fused multicavity hosts have been developed by integrating various sized crown ether rings and the three-dimensional paddle wheel-like triptycene scaffold. Chen and coworkers reported the first triptycene-based tris(crown ether) host in 2005. Connecting triptycene units through crown ether rings resulted in multicavity macrocyclic hosts with three-dimensional central cavities. 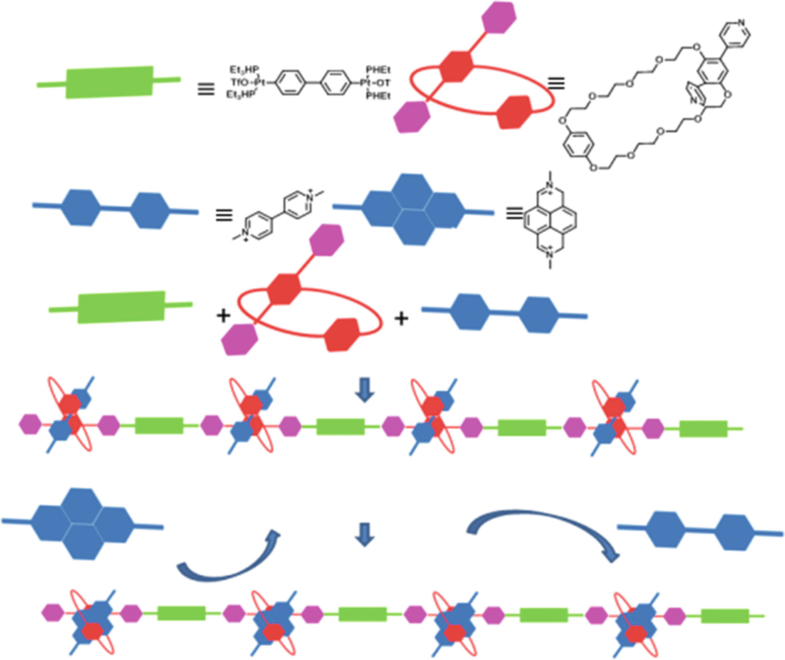 The interacting surfaces of the phenyl planes in triptycene enabled such hosts to recognize a range of diversified guest species by the formation of supramolecular assemblies which were further used in the construction of complex molecular machines. Chen et al. reported a triptycene-derived powerful host for complexation with different guests bearing different topology macrotricyclic which contained two DB24C8 moieties. 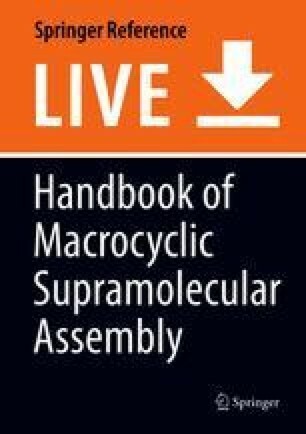 Interestingly, they found that the new macrocycle formed a 1:2 complex with 2 equiv. dibenzylammonium ions, which inspired them to further design and synthesize two dibenzylammonium ions and a self-complementary monomer. They synthesized the monomer and proved its self-assembly into supramolecular polymer networks, which was the first example of supramolecular polymer networks formed by the self-complementary low-molecular-weight monomer assembly, based on intermolecular host–guest interactions. To their delight, they found that the supramolecular networks showed gel properties in chloroform/acetonitrile or acetonitrile solution, and the supramolecular gels exhibited reversible pH- and thermo-induced sol–gel transitions (Fig. 11) . 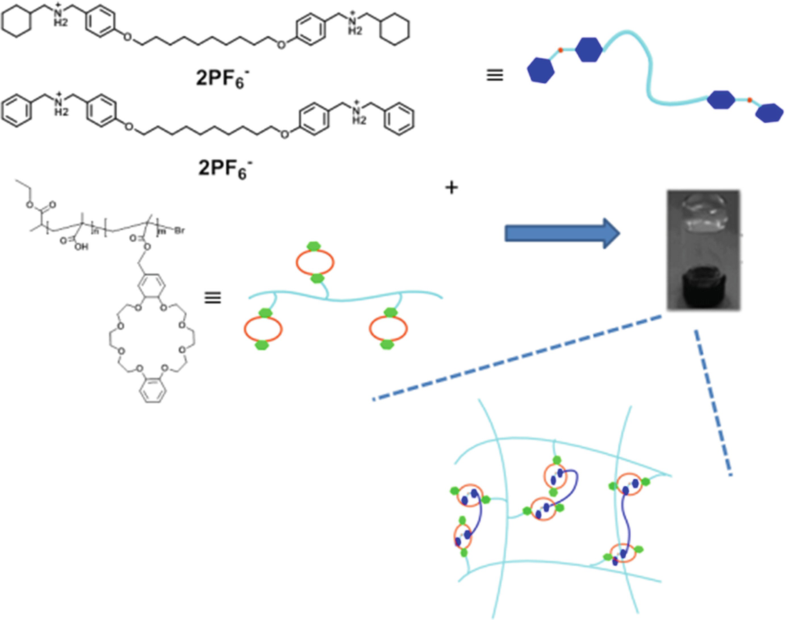 Followed by the above work, they reported a supramolecular polymer gel formed by the host–guest interactions between a copolymer containing dibenzylammonium moiety and a DB24C8-based bis(crown ether). The gel showed both thermo- and pH-responsive behaviors. Moreover, the gel exhibited excellent self-healing property, which could occur under static state and without the input of external energy (Fig. 12) . The formation of the supramolecular networks was supported by viscometry. It was found that specific viscosity of both the complex and the separated polymer changed almost linearly with the concentration demonstrating that no obvious physical interactions occurred. When the concentration reached 22.5 × 10−3 M, specific viscosity of the gel displaying nonlinear increased which was continuously larger than polymer. It was also well documented that the anthracenyl group is not small enough to thread DB24C8. On the basis of the result, they deduced that if 1,10-(anthracene-9,10-diyl)bis(N-benzylmethanaminium) and crown ether host could form a 1:1 “pseudosuitane”-type complex, to introduce a convenient and new method for the synthesis of polyrotaxanes could be developed by just connecting the “pseudosuitane” with an appropriate linker. So, they reported the formation of a “pseudosuitane”-type complex between the host and guest in both solution and the solid state, followed by the synthesis of a linear polyrotaxane by an effective copper(I)-catalyzed azide–alkyne cycloaddition reaction. Formation of the “pseudosuitane” complex encouraged them to further construct a linear polyrotaxane. 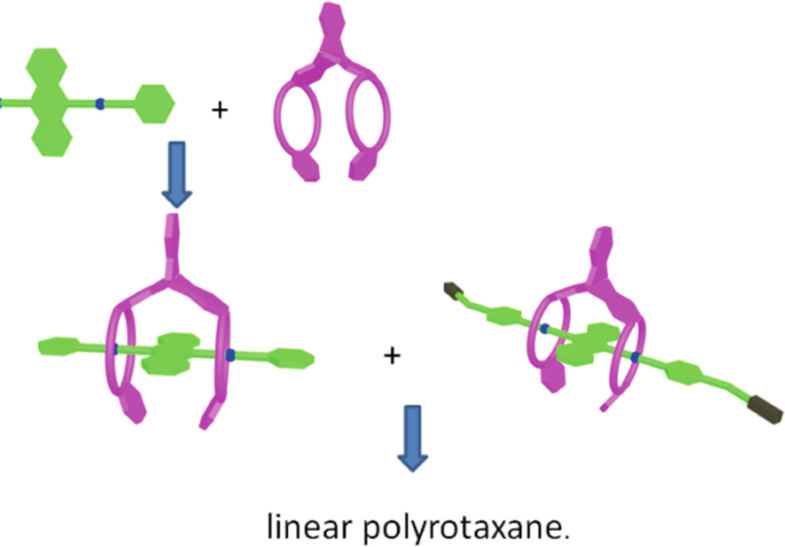 It was found that the Mn of the polyrotaxane was about 11.9 kDa with a PDI of 1.27, indicating that each polymer chain of polyrotaxane was composed of about seven “pseudosuitane” repeating units (Fig. 13) . To develop more sophisticated molecular machines, new kinds of tristable -, -, or rotaxanes were obtained (Fig. 14) , which featured host containing an anthracene unit as the moveable part and pyromellitic diimide, anthraquinone, and N-methyltriazolium as the three stations. In the rotaxane molecular shuttle, the macrocycle M can be controllably and reversibly switched among the three stations using stimuli. Moreover, the motion mode could be extended to the oligorotaxanes, creating a synchronous behavior for M and producing an original and visual prototype – molecular cable car for artificial molecular machines (AMMs). The study presented here also heralds the feasibility to control the submolecular motion at the polymer level and design novel stimulus-responsive polymers based on the tristable shuttle. So far, limited examples were reported on the dibenzylammonium salt/DB24C8 recognition motif suffering from tedious multistep synthesis toward A2B4- or A2B2-type complementary monomers. Hence, researchers are keeping pursuit to exploit a more energy-saving and economical route to the desired supramolecular cross-linked networks bearing novel crown ether-based building blocks. Secondary ammonium salt/benzo-21-crown-7 (B21C7) recognition motif is an appealing choice exhibiting easier availability and the enhanced binding property . Wang et al. involved the interchain interactions between the complementary homoditopic benzo-21-crown-7 cross-linking agent and the secondary ammonium salt-functionalized graft polymer. Such strategy could avoid the stepwise incorporation to significantly simplify the synthetic procedures onto the scaffold. By increasing the concentration of the monomer to a high level in acetonitrile, the resulting cross-linked networks could immobilize the solvent and lead to the formation of supramolecular gel, which exhibits chemo-, pH-, and thermo-responsive gel–sol transition behaviors. Moreover, the gel would be an excellent candidate for the development of smart materials with desired functionalities embedding multistimuli-responsive features (Fig. 15) . The [c2]daisy chain involved in the structures suffers from low reaction yield and tedious preparation. 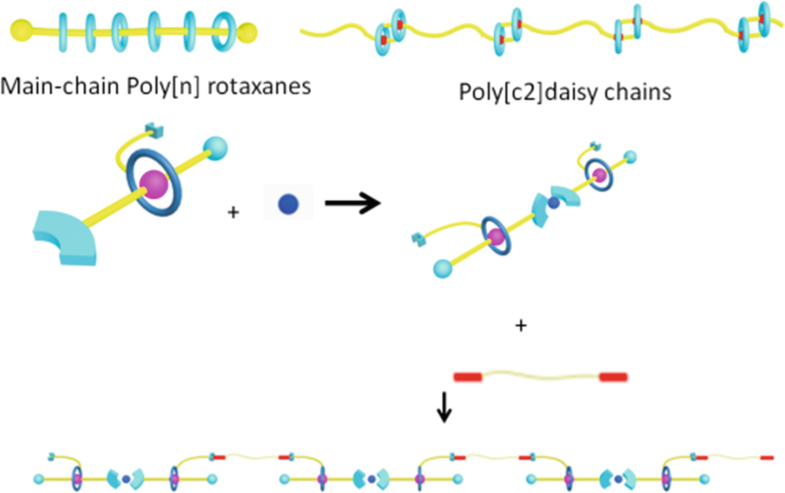 High structural symmetry of the [c2]daisy chain further restricts the formation of functional supramolecular architectures. To solve this problem, an alternative way is to use rotaxane as the basic building monomer. Interestingly, kinds of functional groups could be introduced asymmetrically into the axle and wheel sites of the rotaxane scaffold, facilitating the subsequent polymerization steps . Wang et al. have successfully constructed supramolecular polyrotaxanes via the hierarchical self-assembly strategy. The integration of two orthogonal noncovalent interactions into the rotaxane monomer further facilitates the chain extension. The new types of mechanically linked supramolecular polyrotaxanes are regulated in a controlled and facile manner which motivate them to explore their potential applications in the future (Fig. 16) . Hyperbranched supramolecular polymers (HSPs) possess not only the advantages of traditional hyperbranched polymers but also novel properties, such as self-healing and stimuli responsiveness. Hydrogen bonding, one of the most useful interactions to hold supramolecular networks together, is ubiquitous in many systems such as the double helix DNA structure. By employing host–guest interaction and triple hydrogen bonding, Qu et al. have constructed a hyperbranched supramolecular polymer. This result was confirmed by the combination of various techniques, such as viscosity measurements 1H NMR, AFM, DLS, and SEM (Fig. 17) . Zheng et al. reported a low-molecular-weight gelator. Gels could form both in organic medium and water using this gelator. Each part of the unsymmetric bolaamphiphile of the gelation property was carefully investigated by designing a series of analogues. In order to get further understanding of the crown-based gelator, two new gelators were successfully prepared with better gelation properties. This simple framework can be seen as a new way to construct new low-molecular-weight gelators (LMWGs), which can gelate in organic solvents and water (Fig. 18) . Takata et al. have reported the synthesis of a challenging target polymer in one-pot way in the polyrotaxane (PRX) family. They found that chain-type PRXs (CE-PRXs) are soluble in typical organic solvents (DMF, etc. ), ignoring their polyionic structures. Another method enables the controlled synthesis of PRXs involving polymerization of pseudorotaxane monomers, possessing the desired rotaxanation ratios. Complete neutralization promotes the crown ether (CE) translation remarkably. So far, a variety of CE modifications enable versatile functionalization of polypseudorotaxane (PRX). Thus, their study heralded rapid progress in the fabrication and application of CE-PRXs (Fig. 19) . Supramolecular polymers constructed by metal-directed self-assembly via host–guest association and metal–ligand interactions attract more and more attention owing to their numerous interesting properties and potential applications. The strong binding between terpyridines and metal ions (Zn2+, Fe2+, etc.) can enable the easy construction of supramolecular polymers through the intermolecular coordination of ditopic hosts bearing two terpyridine terminals with metal ions, and the resultant supramolecular polymers can be reversibly disassembled through the addition of competitive ligands or metal ions We have fabricated a supramolecular gel with a three-dimensional network structure following the pathway of the primary assembly of bis(terpyridyl)dibenzo-24-crown-8 by metal coordination polymerization, grafting of anthryl-dibenzylammonium guests, and photo-induced secondary assembly. This supramolecular gel can reversibly convert to the soluble 1/Zn/2 assembly under heating and recovered under light irradiation. The stimuli-responsive sol–gel transformation property, along with the ease of preparation, will make this supramolecular gel well suitable for a variety of important biomedical and industrial applications (Fig. 20) . In this chapter, the development of pseudorotaxanes based on crown ether was introduced comprehensively. We discussed their synthesis, stimuli-responsive movement, and their function and applications. Given the unique structures and stimuli-responsive properties of crown ether and DBA, the dissociation and association of pseudorotaxanes makes them to be good candidates for molecular switches, molecular locks and keys, and molecular logic gates. Chemists also have studied their molecular machines in gels, which enable the functions of ion sensing, nanovalves, and single-molecular imaging. Up to now, studies on pseudorotaxanes have been widely explored. However, it is just the beginning. We thank NNSFC (21432004, 21672113, 21772099, 21861132001) for the financial support.